Last November my Dad turned 50 and to celebrate, he and I went for a 3 day trip to his favourite city in the world, Prague. I had been once before with my Dad back in 2007 but at that point he had only been a couple of times, since then he has been on at least 10 more occasions, so I was excited to go again nearly a decade later, with my very own personal veggie tour guide. We stayed in an apartment pretty central and spent most of our time in the touristy bits of Prague eating and drinking so hopefully if you’re planning a trip and are veggie or vegan these little reviews might come in handy…… Sorry for lack of photos, I’m rubbish! In short: Average American-style food with plenty of veggie and vegan options in a cool setting…. although not as cool as I remembered. As far as I am aware The Globe Café and Bookshop was one of the first places my dad and step-mum discovered in Prague and visiting there was one of my favourite memories from the 2007 trip. It had felt so cool and artsy to me back then. The vibe is still pretty cool, walking through the English-language bookshop to the café at the back of the space there are definitely worse places to have lunch. The menu which is American-influenced features all the usual suspects. We went early afternoon on a Saturday and they had the Brunch menu running. I went for a Soy Cappuccino and we both had the Huevos Rancheros, it was good but not startling. Overall, I would recommend The Globe as a relaxed and safe veggie option if you’re in the area. The staff are friendly and the food is good but flyers advertising their Saturday night karaoke confirmed that they have definitely lost some cool points since my last visit. In short: Delicious and authentic meze at a crazy-low price! The first time we tried this restaurant we were turned away (it was getting petty late) but I was keen to return the following night to try again. I’m a massive fan of meze and my dad had been on his previous trip and said it was good. We picked a selection of meze to share from the fairly standard Middle Eastern menu; Hummous, Baba Ganoush, Falafel, Tabbouleh, little cheese and spinach pastries and of course pitta breads. The food was amazing and as good as any Middle Eastern food I’ve had in the UK. The vibe is relaxed and in total, with a bottle of wine and a beer, our meal cost about £20.00 for the two of us! There are a few Mamacoffee shops dotted across Prague and one of them was just around the corner from our apartment so we popped in on the way into town one morning for a coffee and some cake. Again, this modern little café had a really nice relaxed feel to it and the staff made us welcome straight away by explaining that we could choose a table and they would come over to take our order. I opted for a soy flat white and a piece of their stunning (looking and tasting) cinnamon flavoured cheesecake. Although I went for a very non-vegan option there was were a couple of vegan cakes on offer too. From looking back at their website it also looks like they do a good choice of savoury dishes too with lots of vegan options so well worth bearing in mind! Countrylife is a bit of an institution in Prague, slap-bang in the middle of all the action at the bottom of St Wenceslas Square its location is ideal for when you’re doing the touristy thing. Less of a restaurant and more of a canteen; its self-service and you pay for your food by weight! We went towards the end of the day which meant some of the options were running low but I didn’t mind this as it meant we missed the crowds. It’s the kind of place where you grab yourself a tray and a plate and slide along the runners past the various dishes, adding to your plate as you go, problem is if you don’t know what’s up ahead you might fill up your plate with the wrong stuff at the start and end up with massive food envy! (The trials and tribulations of a food-lover, ey!) Luckily, as it was quiet, I was able to do a quick run up and down the line to asses all of my options before loading my plate, with an admittedly random selection of foods (too many choices!!). I can’t really remember any of the specific elements of my meal but it compromised a selection of hot and cold bits all of which were tasty. Surprisingly this isn’t one of the cheaper places for a veggie to eat and the service is kind of grumpy but it’s still worth a visit. The shop is also a great place to stock up if you’re planning on doing a bit of self-catering. Worth noting it’s closed on Saturdays too. On our last day we went up Petrin Hill and popped into the handily placed vegetarian café , Green Spirit, at the bottom of the hill on the way back to the apartment. This café is pretty small with only a few tables inside however from the photos on the website it looks like you can sit outside in the Summer. I was impressed by the menu, although not huge there was a good variety of options, a few Mexican dishes, some more Oriental-style mains as well as burgers and pasta too and around half of these were vegan. I went for the quesadilla, a soy cappuccino and because I just couldn’t resist once I’d seen it… a lavender lemonade!! The mains were massive when they came, a big quesadilla with a mound of well cooked rice and all the essential sides, guacamole, salsa and jalapeños. My dad had a veggie chilli which came in a humongous deep-fried tortilla bowl. The lavender lemonade was also definitely worth a try, sweet and floral, but not too flowery. All together 2 mains, 2 hot drinks and 2 cold drinks came to £15.00! For over a year now I have been following the 5:2 diet and although I have the odd slack week here and there I’ve generally fully incorporated it into my life. It’s something I actually get enjoyment out of (maybe don’t ask me to confirm this at 4pm on a fasting day!!) and if the research is to be believed it’s something that my body benefits from in a number of ways. On my 500 calorie days I have opted for the tactic of skipping both breakfast and dinner (the midday meal) and just having one 500 calorie meal towards the end of the day, once I have gotten in from work. I know this isn’t the best option for many people, but for me, whilst I am busy at work, I find it much easier to go out without food than when I am home in the evening. One possible downside of the 5:2 diet that I have noticed is that, if you’re not organised, fasting days are not conducive to cooking and it is easy to fall into the trap of living on shop-bought pre-calorie- counted food. This can often be boring and potentially not very healthy but very rarely do I feel like taking the time to figure out how many calories are in 7g of curry powder! Thankfully I did make the effort a couple of weeks ago because now I have an easy, nutritious, cheap and tasty meal that comes in just under 500 calories for my fasting days. Dahl has always been a favourite of mine, it’s the mac and cheese of Indian food; comforting and warming. This recipe is pretty simplistic, obviously I had to cut it back to the basics in order to keep the calories low but trust me it tastes great! Serve in a bowl (it will be quite liquidy) with a toasted pitta and a sprinkling of coriander leaves. So I finally did it….. got hold of and cooked with Green Jackfruit! People who don’t spend their time scrolling through various vegetarian and vegan Facebook groups or Instagram pages may not be privy to this intriguing ingredient however it has long been used in sweet and savoury dishes all over the world from Bangladesh to Brazil. Recently, however, it has been making massive waves across the vegan world….. The reason for the excitement is because, in its unripen state, the jackfruit provides a perfect vehicle for flavours and it’s texture is surprisingly similar to slow cooked meat….and in the current culinary hipster world, where Pulled Pork is on every other menu, it’s great to have a vegan alternative – especially as it’s a natural product which can be used in a variety of ways. I first got to taste the virtues of Jackfruit from @thehungrygecko at Manchester International festival when it was used in a Sloppy Joe Rendang, the texture was like nothing I had had before (growing up a veggie) but it definitely looked meaty and the Asian flavours had been totally absorbed. I decided to risk it and try it out for a Bring n Share lunch at work – tentatively I wrote my dish on the list of who’s bringing what…. ‘Vegan Pulled BBQ Jackfruit and Avocado Slaw Wraps’ – thankfully they went down great so here’s the recipe – adapted from http://minimalistbaker.com/bbq-jackfruit-sandwiches-with-avocado-slaw/ which apparently is loosely adapted from Blissful Basil – we’re spreading the jackfruit love! Rinse and drain the jackfruit and shake off as much water as you can. With each piece of jackfruit pull off the outside stringy bits of fruit into little bits and add to a large bowl. Keep the solid bits of core to one side and then chop into small pieces and add to the bowl with the rest. Sprinkle on the sugar and spices (everything but the BBQ Sauce). I think you can let your culinary juices flow a bit here, if you like it spicy add more chilli etc. Stir to fully and evenly coat the jackfruit. Heat a large pan over a medium heat and add a splash of oil. Add the jackfruit to the pan and fry until any remaining water has evaporated and it is starting to catch on the bottom of the pan. duce heat to low- medium, cover and cook for about 20 – 30 minutes until has reduced to a sticky consistency, stirring occasionally. To make the coleslaw; mash the avocado with the lime juice and some salt and pepper to taste and thin with a little water. Mix the veg and coriander in a large bowl and coat with the avocado dressing. To serve I just put some of the warm jackfruit in a wrap with a dollop of coleslaw and well….. wrapped!! Veggie Burger Triumph! – at last..
After various busy weekends of moving house and seeing friends I got the chance on Monday to spend a bit of quality time in the kitchen again. 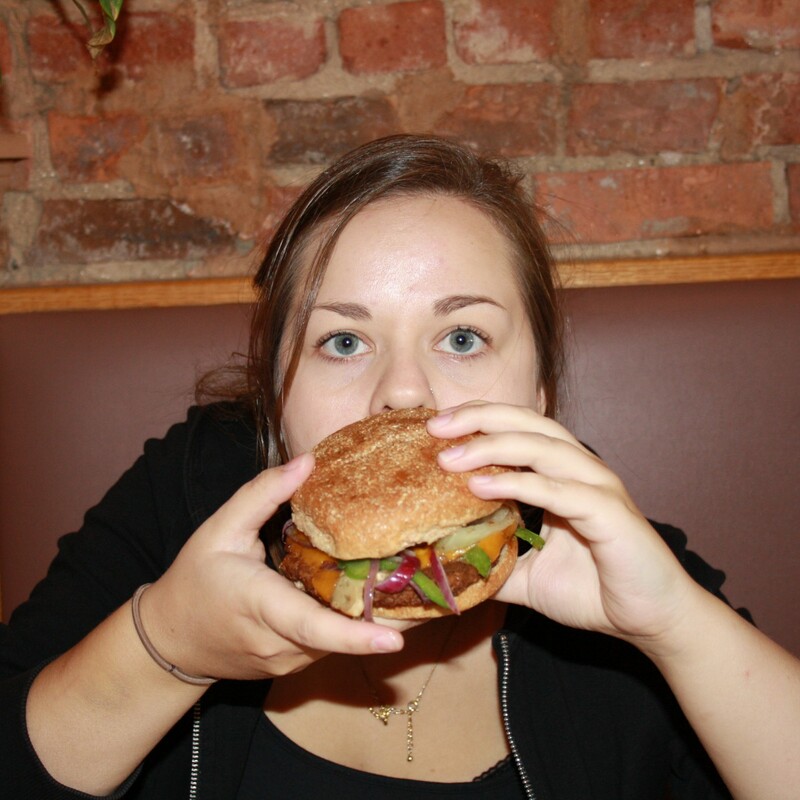 A colleague recently recommended The Really Hungry Burger recipe by Anna Jones. My experience of making veggie burgers is limited to a particularly frustrating lesson in school where instead of being given the chance to follow a veggie burger recipe I was forced to follow the same beef burger recipe as everyone else, just replacing minced beef for Quorn mince; needless to say this did not work and I imagine there were many ‘told you so’ glares at my teacher from my 14yearoldself. In addition to this pointless food technology lesson I have never found veggie burgers very inspiring. I often prefer the meat substitute, ready-made Quorn or Soya burgers to the bean or vegetable based burgers in many recipes. Partly this is down to texture, I think it is important that a veggie burger doesn’t squish out of the side of your bun when you bite into it, and vegetable and bean burgers are often too mushy for my taste. I also find many veggie burgers too heavily spiced; the classic spicy bean burger is not what I want in between my white sesame seed bun, plastic cheese, mayo and iceberg lettuce. Obviously this is down to personal preference, and maybe I’m a bit of a heathen in this respect, but I want something ‘meaty’ – savoury and with some texture. As well as having a cool name The Really Hungry Burger appealed to me because ingredients-wise it seemed promising. Mushrooms, thyme, parsley, tahini and soy sauce – all earthy flavours and whilst some mushy beans are required to hold the mix together, the majority of the ‘filler’ is brown rice – great for texture. I halved the recipe but otherwise followed it pretty much to the letter (I used breadcrumbs not oats). I wasn’t disappointed, the burgers browned up really well in the oven and held together much better than other veggie burgers, the outside of them were toasty and had a nice chew. The flavour was great, however next time I would probably slightly reduce the lemon zest or possibly leave it out all together. It wasn’t an unpleasant flavour but again I would have preferred more of a deep earthly taste than the zestyness that the lemon provides. I served them on classic burger buns with vegan (violife) cheese, avocado, red onion and tomato with sweet potato chips on the side. It’s a recipe I would definitely recommend you try and I’m excited to get out the ones I have in the freezer for a quick tea one evening. Thanks Anna! Ok this is definitely me cheating a little but I promised a recipe a day for Meat Free Week and that’s kind of a tough task when you have a life. So tonight’s recipe is super obvious and ridiculously easy but not everyone can cook, right? (I’m moving in with a dear friend next week who last night attempted to fry an egg in a griddle pan) and many of you, like me, lead busy lives. So this is what I made for tea tonight and I think it makes a great quick, satisfying meal for any time of day. Ingredients – can anyone else not spell ingredients?! I spell it ingrediants every time I write it!! 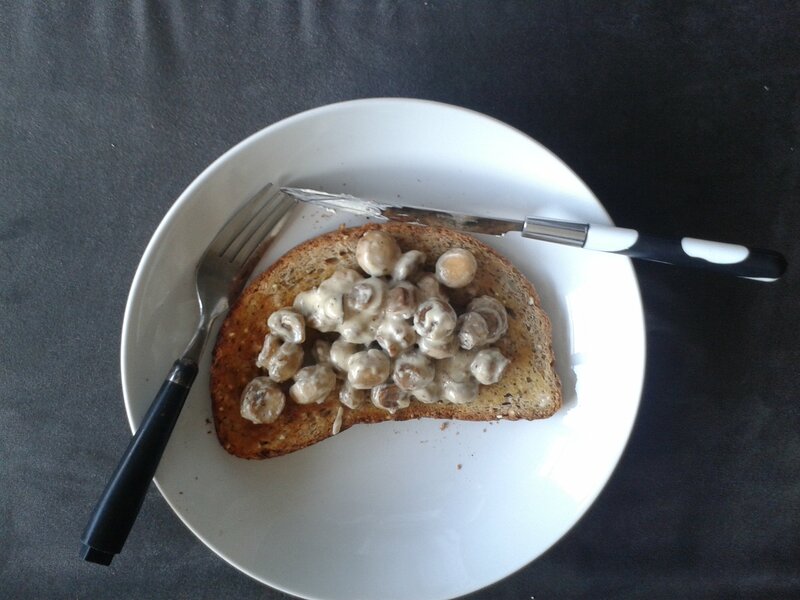 Pour the creamy mushrooms over your toast and serve. 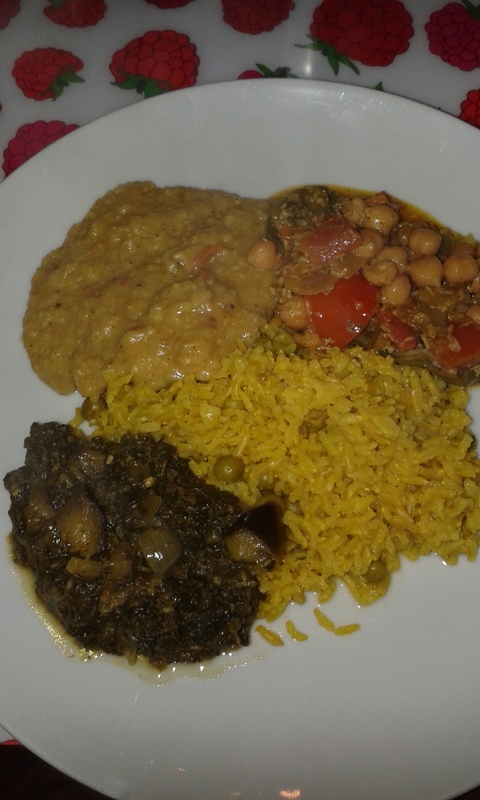 Last night I was lucky enough to have a friend cook me tea, he made a trio of vegetarian curries and rice (despite not being a veggie himself) and they were all delicious! So I thought why not pinch one of his recipes and include it on here. This spinach and aubergine curry was particularly tasty and the way the aubergine soaks up all the flavours makes it a really creamy and smooth curry with just hint of spice. Melt down a couple of tablespoons of ghee in a large pan (preferably one that has a lid/something you can use as a lid). Or if you are using oil instead heat the oil. Add the garam masala, turmeric, red chilli and garlic (finely chopped ) and a pinch of cumin and ginger. Finely chop the onion and fry together with the spices on a low heat until softened. Add the two diced aubergines and fry off for a couple of minutes, before adding the spinach, the coconut milk and a splash of water. So I’ve noticed a lot of what I cook is Mexican inspired but I think the flavours are so delicious and there is such a variety of accessible dishes to choose from all with relatively few ingredients so why not! 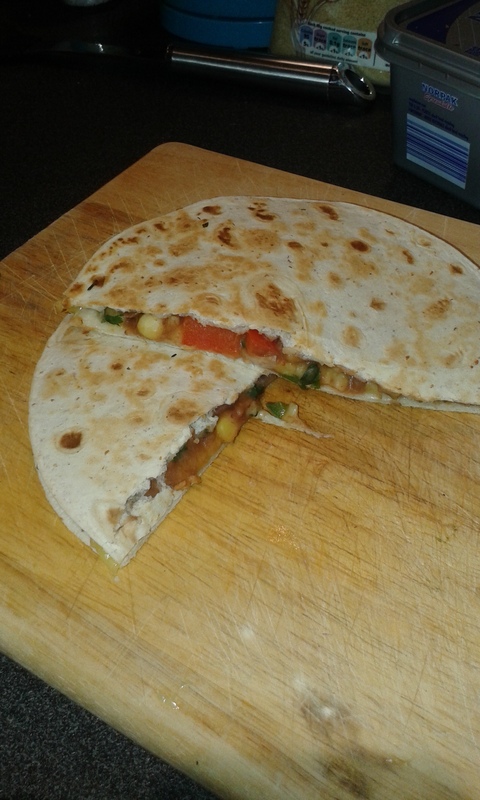 This quesadilla recipe is particularly easy and very adaptable depending on what veg you have, the basic ingredients are refried beans, cheese and tortillas (actually cheese can be left out if you are feeling healthy). 3 tablespoons of sweetcorn – I guess?! Fry the chopped onion and peppers in a splash of oil in a reasonable sized saucepan on a medium high heat until soft and slightly brown. You could also add a chilli at this point if you like it hot! Add the sweetcorn and fry for a couple more minutes. Next add the refried beans and stir together with the veg, leave to heat through. This should only take a minute or 3. When the mix is hot, add the chopped coriander if you have it. Meanwhile heat a frying pan and grate some cheese. Next assemble your quesadilla. Put one tortilla on a flat surface (chopping board is fine) spread a layer of the refried bean / veg mix across the whole tortilla. Sprinkle a sensible amount of cheese to cover the beans and sandwich the mix with another tortilla. Transfer the tortilla sandwich (quesadilla) to the hot frying pan and leave to toast for a minute or 2, every so often peering under the edge – you want it to turn a light golden. Once achieved, you need to flip. As earlier mentioned, small tortillas are much easier to flip just using a fish slice/ spatula. If you are doing big ones I would suggest you place a plate over the top of the quesadilla whilst still in the pan, and then whilst holding tightly down on the plate turn the pan upside down so that the quesadilla ends up on your plate. Then you can slide it back into the pan to toast the other side.